Happy Halloween 4" x 4" Collage, originally uploaded by DianthusMoon. I started to cut the square for this card from last night’s card and I took a double take. My cards were getting much larger than 4″ x 4″. I don’t know when that happened, but if I could cut off 1/2″ or less to get back to 4″ on a few of the ones I made in the last few weeks. I try to do at least one duo with pointed hats each year for Halloween. 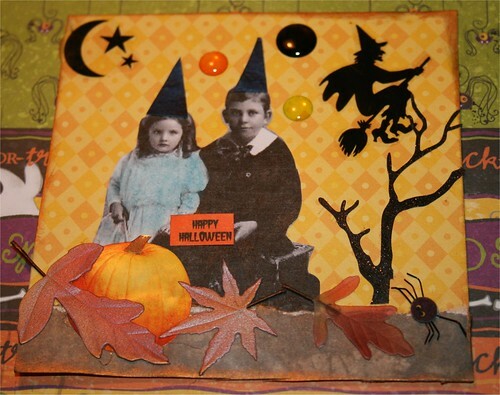 I will probably do another few Halloween ones-remember I have 365 collages to do-minus about 45 now. Then I made this postcard for a little girl with a brain tumor from Ohio. Reagyn is unselfishly running an effort to collect soda tabs that will help Ronald McDonald come to a big town’s hospital near her. I have her address (which is the school’s address) if you’d like to send her a postcard from where you live and tell her a little about your area. That’s all she asked for. Today I made an item for a friend, it’s autumnal and I want to send it off before sharing it. It turned out so cute. Brian thinks I should be making lots of stuff like this to sell. My mom went to the doctor and has a terrible allergy which she say she has seen a lot of lately. Mom’s blood pressure was a little bit high which concerned the doctor, but it may have been because of where she was or is stress related. She tends to jump to conclusions. It was like 156/73. Mom will be in the next town over to get her hearing aides adjusted but didn’t act like she would come over here. I hope she changes her mind. We got your handmade postcard today! I saw it on here before we even got it and I must say when we came across it today in the mail I jumped in joy to tell all of our secretaries about it! I can’t wait for Reagyn to see it tomorrow at school! Thank you again for homemade postcard!